Egyptian Foreign Minister Sameh Shoukry and his Sierra Leone counterpart Alie Kabba discussed here on Thursday promoting trade and investment ties and activating signed agreements. They met on the sidelines of the 34th Ordinary Session of the Executive Council of the African Foreign Ministers that kicked off earlier today at the headquarters of the AU Commission. Egyptian Foreign Ministry Spokesman Ahmed Hafez said Shoukry expressed Egypt's interest in boosting cooperation with Sierra Leone in capability-building through a training program presented by the Egyptian Agency of Partnership for Development (EAPD). 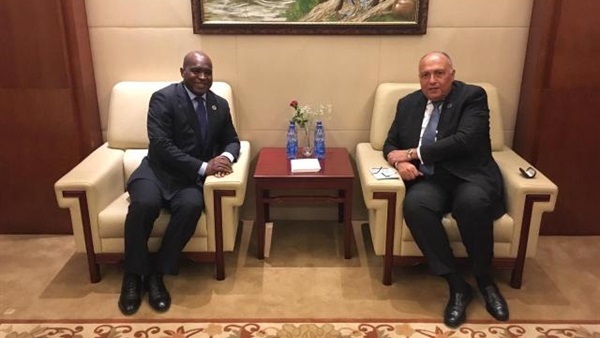 Egypt looks forward to working with all African countries during its 2019 AU chairmanship, especially in the fields of economic integration as well as economic and social development, Shoukry told Kabba. The two-day meetings of the Executive Council of the African Foreign Ministers will set the stage for the 32nd African Summit, during which President Abdel Fattah El Sisi will receive the AU presidency. The summit will be held on Sunday and Monday.